Lochgelly came to the attention of the world’s media last month when one of its most famous sons, jazz legend Joe Temperley died, aged 86 in New York. Lochgelly, Manhattan, as Joe liked to say, remained close to his heart, where he helped to nurture a living tradition of jazz-playing reaching back to Duke Ellington. Joe was last in Lochgelly a year ago in March when he played a sell-out concert at the Lochgelly Centre and gave what turned out to be his last workshop with FYJO, the Fife Youth Jazz Orchestra, which he mentored for decades. Everyone at FYJO felt privileged to have known Joe, and their up-coming annual summer concert has been turned into a special tribute to the great man. The son of a bus driver, Joseph Temperley was born in Cowdenbeath in 1927 and grew up in Lochgelly. The second youngest of the children, he left school at 14 to work in a local butcher’s shop. 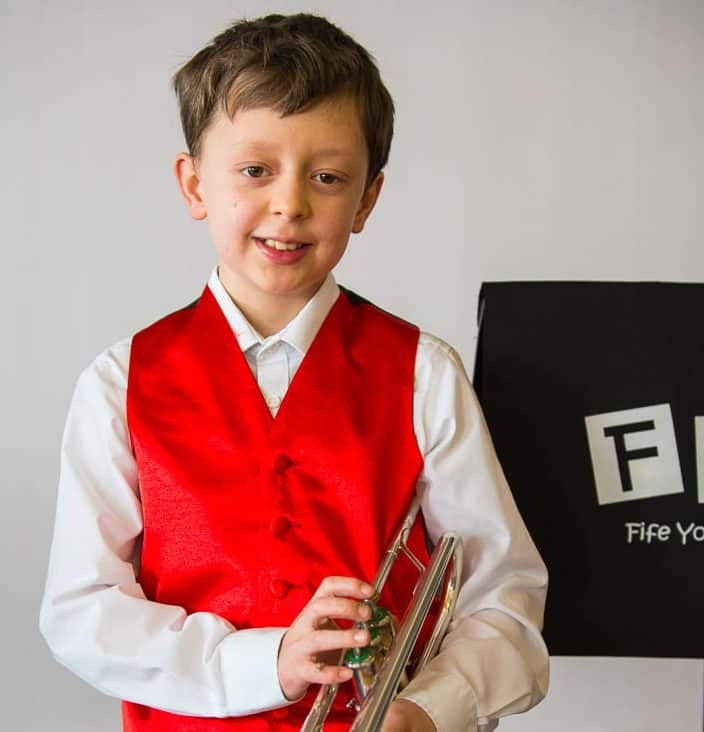 By this time, he was already playing cornet alongside his elder brother, Bob, in the Cowdenbeath Brass Band – and it was Bob who bought the youngster his first saxophone, an alto, so he could join his dance band. As Temperley liked to tell it later, after six months of lessons he could play better than the teacher. He soon formed a band called the Debonairs, in which he played tenor sax. By the age of 17, he had left Lochgelly for the bright lights of Glasgow. After playing at the Piccadilly Club on Sauchiehall Street for 18 months, he auditioned for Tommy Sampson, a famous big band leader and trumpet-player from Dunfermline, who signed him on the spot. Still only 19, Joe moved to London, rapidly working his way up through the dance band scene, from Terry Sampson’s band to Joe Loss’s, Jack Parnell’s and Tony Crombie’s. Finally he joined Humphrey Lyttelton’s band, where he switched to the baritone sax. Joe’s first taste of New York, the epicentre of jazz, was with Lyttelton’s band in August 1959. “I arrived wearing a Harris tweed jacket. It was so hot, I’d sit in the bath all day and only go out at night!’ After returning from three weeks in jazz heaven, Joe was desperate to get back – and in December 1965 he moved permanently, taking his wife and young son with him. Six months later, Joe was signed by the Woody Herman band, but after two years on the road, he quit, returning to New York where he freelanced quite contentedly for several years, with a regular gig with the Thad Jones and Mel Lewis Jazz Orchestra every Monday at the famous Village Vanguard club. In October 1974, Harry Carney, the “father of the baritone saxophone” and mainstay of Duke Ellington’s orchestra for almost half a century, died (only five months after Duke himself). Joe was asked to play at the funeral. He performed Sophisticated Lady, Carney’s great feature in the Ellington repertoire. Impressed by the similarity in tone, Duke’s son who was now leading the band, invited Joe to take Carney’s place. He stayed with the Duke Ellington Orchestra until 1990. The effect of his presence on the sound of the saxophone section, when recorded, is uncannily true to the original, notably on the soundtrack of the film The Cotton Club (1984). Hearing Joe perform at an Ellington tribute concert prompted Wynton Marsalis to recruit him for newly established orchestra Jazz at Lincoln Centre. Joe was delighted because for the first time he had “a real job, with health benefits, dental benefits and a pension”. Marsalis, who invariably introduced Joe at concerts as “the most soulful thing to come out of Scotland”, always gave him solo features, including his show-stopping rendition of Ellington’s Single Petal of a Rose on bass clarinet. Lauded for his sumptuous tone on baritone, Joe was an inspirational teacher in the faculties of the Manhattan School of Music and the Juilliard, proud that his many students had made good. Extensively featured on Marsalis’s compositions, Joe also recorded for the Scottish Hep label. Outstanding among these are Nightingale (1992) and With Every Breath… (1998). The first contains the piece with which he often ended his solo concerts, a moving, unaccompanied version of My Love is Like a Red, Red Rose. A burly, humorous man, Joe remained a fervently patriotic Scotsman, his moustache bristling dangerously at any suggestion that he might be anything else, least of all English. He followed the progress of Cowdenbeath FC regularly on the internet. But Joe never stopped playing. Interviewed for BBC Radio Scotland in 2009 he famously said: “Jazz is life”, when asked why he hadn’t retired. Until relatively recently, he was still touring the world with the orchestra – always with his devoted wife Laurie at his side – and coming back to Scotland as often as he could. Despite increasing frailty, he turned in a series of terrific and typically swinging performances, switching between the baritone and the bass clarinet during a mini tour with Brian Kellock in March 2015. Leading Scottish jazz musician and educator Richard Michael met Joe in 1978, beginning a life-long friendship which saw Joe come along to rehearsals of the Fife Youth Jazz Orchestra, the ground-breaking youth jazz initiative founded by Richard in 1976. Informal FYJO workshops led Joe and Richard to start what was then known as the Fife Jazz Summer School, which is still going strong. Joe’s regular masterclasses inspired generations of young Fife players. His musicality always stood out. Richard recalls how Joe could pick up a band part at random and sing it perfectly, telling his students: “A little old lady in Lochgelly taught me how to sing using tonic sol-fa before the war – and if you can’t sing it, you can’t play it”. FYJO’s annual summer concert with a special tribute to Joe Temperley takes place at Cupar Baptist Church at 7.30 pm on Friday 10th June. Tickets £8 or £5 concession and are available from FYJO practices on a Thursday night at Lochgelly centre between 7.15pm and 9pm, telephone/text 07749 925169 . This concert is now famous for its’ delicious home baking provided by the players’ families and friends, along with tea and coffee all for a donation of your choice- this is an amazing array of home baking not to be missed, never mind the magical jazztastic music provided by the FYJO players. FYJO is Lochgelly-based, rehearsing every Thursday evening during term-time at the Lochgelly Centre. Rehearsals are open (anyone can come and listen), and there are no auditions. Everyone aged between 8 and 24 who plays an instrument at any level is welcome.